Who needs another bird book? Adirondack birdwatchers, and birders elsewhere in North America, have good reason these days to feel as if they’ve been thrust into an Alfred Hitchcock film. Bird books! Bird books! Everywhere we turn, new ones batter our senses, flashing pretty covers, darkening horizons by their sheer menacing numbers, clamoring for our attention and our cash. 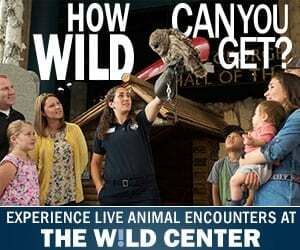 Ever since Knopf published its runaway bestseller The Sibley Guide to Birds in 2000, publishers have been targeting the disposable income of birdwatchers in the same spirit that a barred owl scrutinizes mice. Visit a bookstore or Web bookseller and see what I mean. Books on rare birds, common birds, extinct birds, formerly extinct birds, big birds, little birds, bird songs, bird behavior, bird field marks and even bird droppings and bird feathers crowd shelves and flat-panel monitors. 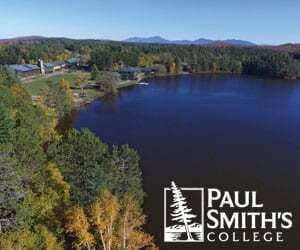 What’s the literate Adirondack birdwatcher to do? No need to throw your arms up in despair. A few of the flock are worth inviting home. 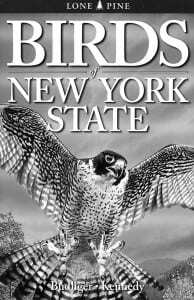 One is Birds of New York State, by Robert E. Budliger and Gregory Kennedy, released this year by Lone Pine Publishing International. This book represents a happy (or at least fertile) marriage of publisher and author. Lone Pine was founded in 1980 in Edmonton, Alberta, and it has steadily built a list of first-rate nature field guides. Most feature Western species. Yet in 1999, Lone Pine brought out George Barron’s Mushrooms of Northeast North America, the most beautiful and useful field guide covering Adirondack fungi. Now it gives us Budliger and Kennedy’s book on the Empire State’s birds. Few naturalists know Adirondack and downstate birds as well as Budliger. A resident of the Albany area, he’s a veteran of countless bird outings at ungodly hours from the High Peaks to Long Island. In a former life, before he became a prolific nature writer and consultant, he worked for the state Department of Environmental Conservation, overseeing its nature education programs. Budliger is a born teacher, with a knack for presenting information in a way that’s entertaining and useful. Budliger and I have crossed paths often over the last quarter-century, but his co-author is new to me. According to Lone Pine, Gregory Kennedy has roamed the world from Southeast Asia to the High Arctic, studying birds and other wildlife. I’m guessing he provided the boilerplate text for this volume, which holds much in common with other Lone Pine titles bearing his name. The publisher is not alone in making modest changes to particular books in order to sell them in different markets. Is Birds of New York State worth owning? It depends on who you are. If you’re a fanatical birdwatcher with a lengthy North American life list, a $1,500 pair of binoculars hanging from your neck and a copy of Sibley in your hands, you don’t need this book. But if you’re a beginning birdwatcher or, like me, someone who loves both birds and books deeply, this is a title you may want to acquire. 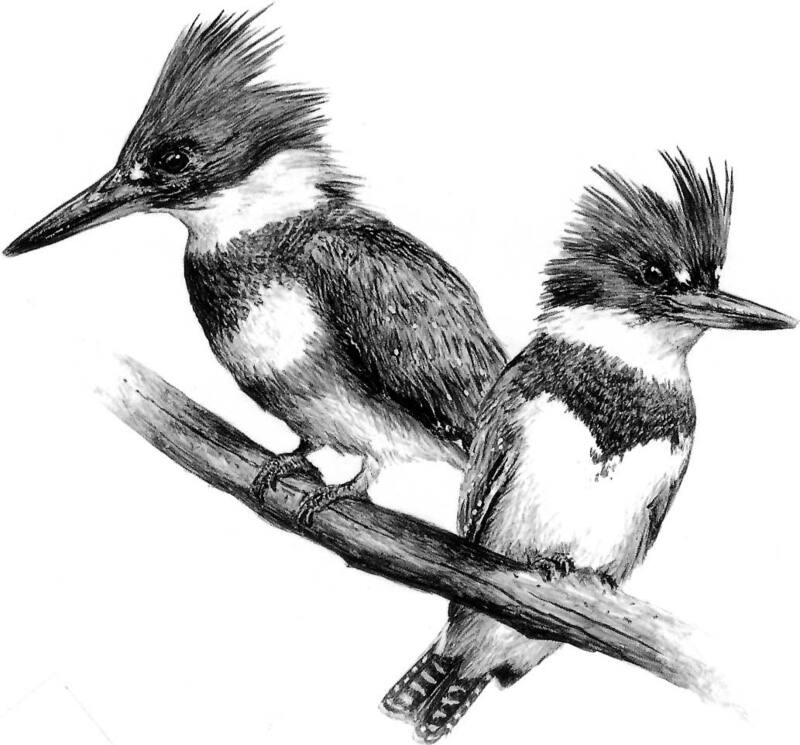 Birds of New York State is a browser’s book. If you spend time at an Adirondack camp, cabin or hostelry, are intrigued by birds and want to expand your knowledge, this is a perfect armchair companion. In a typical field guide, similar species are arranged on the same page to facilitate quick comparisons. Here, it’s one bird at a time. But the format has merit, especially for someone with time to meander. Consider the treatment of one of my favorite Adirondack birds, the chestnut-sided warbler. This is a species, like the white-tailed deer, that flourishes in brushy, cut-over places. Hiking, you tend to run into it in old clear-cuts and blowdown. Some animals avoid breaks in the deep forest, but this gorgeous warbler with yellow cap and ruddy flanks is drawn to them at nesting time. Budliger and Kennedy begin with a concise paragraph in relatively large type, describing the chestnut-sided warbler and sharing a few interesting points about its life. They report, among other things, that John James Audubon saw this species only once in his lifetime and that the recreational birdwatcher can easily outdo the master on this score. This is a neat fact. It’s the kind of thing that grabs a reader’s interest. Ewa Pluciennik supplied the illustrations for this book. On the whole, they’ve done a fine job, using deft strokes of the brush to create birds almost bursting from the page. Below the illustration is a detailed rundown on the warbler. Sections on identification, size, seasonal status, habitat, nesting, nest site location, feeding and singing do a thorough job of introducing the bird and telling its life story. One way in which this book outperforms the best-selling Sibley field guide is in giving mnemonic devices for remembering bird songs. Budliger and Kennedy offer the tried-and-true “pleased, pleased, pleased to MEETCHA!”, which birders have employed for at least half a century to remember this warbler’s song. Sibley coined his own mnemonic, “witew witew witew WEECHEW.”Which do you suppose is easier to remember? What makes Birds of New York State a genuine state guide rather than simply one of Lone Pine’s other regional volumes with a new cover is the “Best Sites” section listed with each species. In the case of the chestnut- sided warbler, which occurs from Montauk to the Canadian border, the information is accurate but not particularly useful. 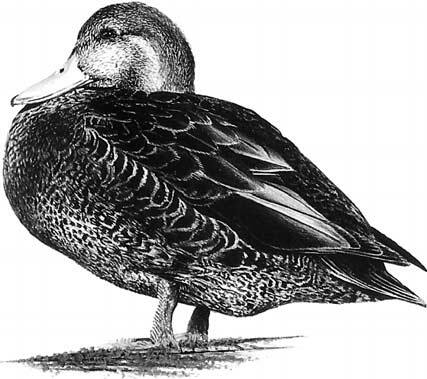 But when it comes to rare, highly local species, unique to the Adirondacks, such as the threetoed woodpecker, gray jay and spruce grouse, the book proves its value. To see these species, the birder is directed to such boreal hot spots as Ferd’s Bog, the Moose River Plains, the Chubb River Swamp, the Paul Smiths Visitor Interpretive Center, Elk Lake and the Bloomingdale Bog. Of course, the Empire State consists of more than just the Adirondacks, and the mountain birder, escaping to the shore for a week in summer, will do well to take this book along. In it you’ll learn, for example, that Jamaica Bay, Jones Beach, Fire Island, Smith Point and Shinnecock Inlet-Dune Road, all on Long Island, are great places to look for the black skimmer. To sum up, Budliger and Kennedy’s Birds of New York State is a classy production, expertly written, handsomely illustrated, and designed to be useful.